IOMOI is one of my favorite sites in the entire world. It's one of those sites where I can't get anything because I can't decide which pattern I like the most. It also makes me want cuter business cards...and a cuter logo. 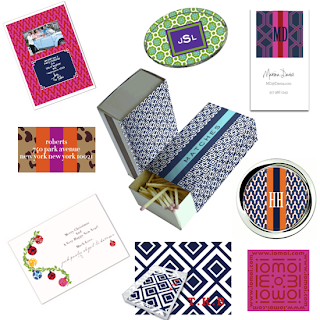 Check it out...and take a look at all the new products they are about to launch like Lucite trays, ice buckets, and bags! On Her Way Home...New Give-Away!! 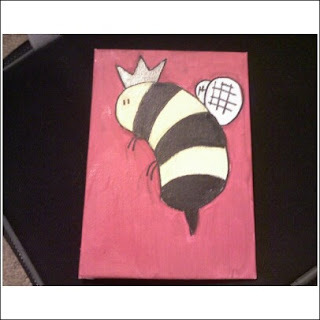 The Queen Bee mini was finished last night and will be on her way home today. A big congratulations again to Natalie for winning. With that...I think it's time for a new give-away. This is the last weekend my paintings will be on display at Books and Books. Last night, D and I went to take a look--- as usual Books and Books was hopping. Their bar was full, the courtyard packed, and beautiful live Brazilian music filled the courtyard on a nice warm fall night in Miami. It was the first time I'd gone to see the work since opening night. I really want to thank all of you who have gone to see them. 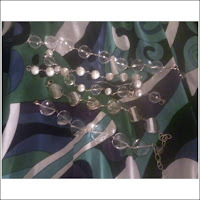 Thus far, two have been sold and will hang in someones home. 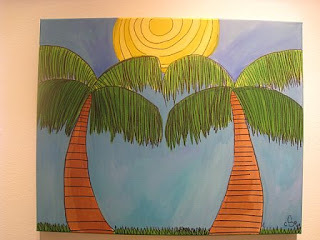 Two Palms is one of the two paintings that sold. Some of my favorites are still there....Nessie, Queen Bee, the mermaids...and Rolling Hills. I'll be taking everything down on Wednesday. One of my dear and talented friends...who also writes a great blog...Kristin Pearce is having a trunk show in her home today and tomorrow. Kristin makes the most beautiful pieces of jewelry which she sells on her etsy shop ( http://www.etsy.com/shop.php?user_id=5562104 ) and at several shops around town and in corners of the states. I always rely on her for great pieces that I know I will have for the rest of my life. 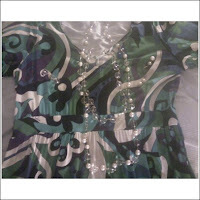 If you want to know more about the trunk show--- email me. A short 3 hours West, North West from Miami is Sarasota, FL. Today, I hopped in a rented Dodge Avenger and hit the road with the Chief Curator and Folk Life Curator for the museum and made our way up to Sarasota. This year, Sarasota is the hosting the Florida Assoc. of Museums (FAM) Annual Conference. Normally the hotels are nice...but this year...it's at the Ritz! The top picture is of the view from our room (I'm bunking up with our Chief Curator)...the next picture if from the courtyard at the South Florida History Museum--- not to be confused with the Historical Museum of Southern Florida (where I spend my days). 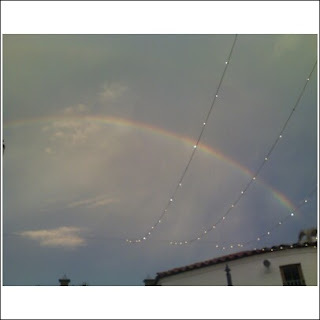 ...and the final picture is of a double rainbow seen from the courtyard at SFH after a passing shower. 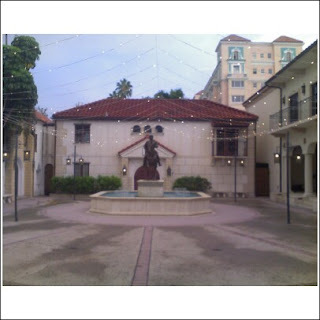 After visiting the SFH Museum we went to the various galleries on the campus of the Ringling School of Art and Design. The main building we visited--- well it had this new building smell that instantly transported me back in time to SMU. It was lovely. Anyhow... tomorrow I am sitting on a panel discussion reflecting on the Key Note speech being delivered by acclaimed Museum professional, Elaine Gurian, who was one of my many Bank Street instructors. I'm really looking forward to it. ....sorry for the boring museum jargon post...but that's what I have been up to. There are three "pies" up at Books and Books right now. Most people have really loved them and so I went back to my sketchbook to revisit some of the original "pies" and some new "pies". This first one, is a new "pie". Can you figure this one out? Well the one under it is one of the first "pies". This one was originally drawn in the summer of 2000, right after graduation from SMU. I think they are both pretty clever. There are others where these came from --I may load them all on flickr, I haven't decided yet. 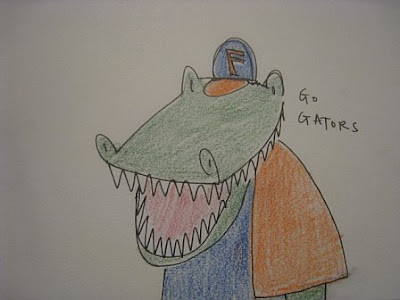 I've been meaning to paint Albert...the University of Florida mascot for some time now. I just think he is the cutest...(after Peruna, SMU's Mustang). 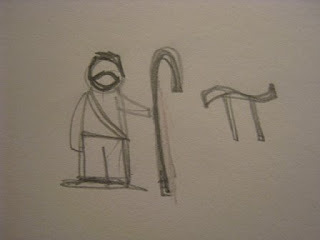 This is a sketch I did of Albert about 2 years ago. Honestly...isn't he cute? Today---UF beat Tennessee and is 3-0...while UF was playing my beloved SMU Mustangs started their game...which they are currently winning. So in honor of it being a good old fashioned college football Saturday .... I wanted to post my Albert. 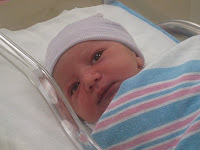 A couple of weeks ago my friends Katie and Brette had a sweet little girl they named Adria. Over the past weeks the three of them have been adjusting to life...and doing a fine job of it. Recently I stopped by to check on them--see the finished nursery and gather inspiration for her nursery painting. 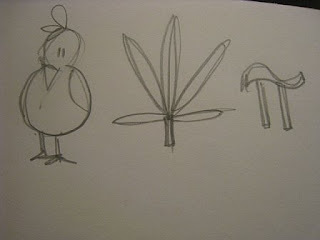 These are the sketches of what I came up with. I am simply waiting to hear what they say in order to get started on their piece. So the night before Julia was born, Kiki was over at our house. Her final request before diving back into newborn mommy-hood was to come over and watch Twilight. As Edward (the most beautiful vampire known to man) graced the screen...I started sketching Julia's painting. I decided to go with a "J" since Olivia got an "O" before she was born. ...and since the girls will be sharing a room--- the paintings will compliment each other rather than compete. So-- this is what I came up with. Kiki ended up voting for the one on the bottom. I added some color...and there you have it. 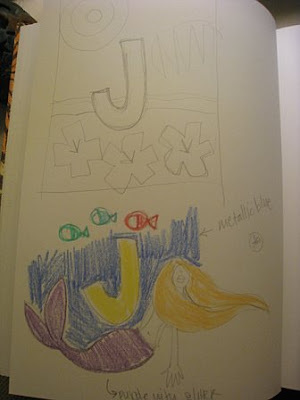 The preliminary sketch for Julia's "J". 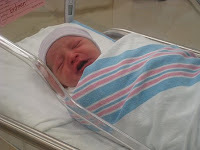 Fashionably late like her Tia Ceci... today after a 10 day wait...Julia Grace joined the Kauffman-Slesnick clan. Granted...mom was endused...Julia was not ready to come out yet. Dr. Perez (who is my "girl" doctor too) even had a hard time breaking her water this morning. In the end...it was a fast delivery...3 hours from start to finish. Mommy and baby are lovely. As for Julia...honestly...she looks just like Olivia did. 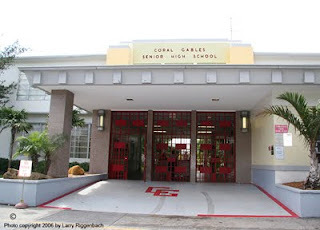 In 1993 I started my sophomore year at Coral Gables Senior High. Over the course of three years, I made life long friends...friends I still talk to to this day...friends who are like family to me. The class of 1996 is full of wonderful people, fond memories, and the teachers who instructed me are still a part of who I am. "Are you from Gables, I said from Gables where friendly halls meet up with our (something) You see our colors, I said our colors, Coral Gables Crimson and Grey. Are you from 103 or 301 or 409, anywhere inside the Coral Gables line, are you from Gables, I said from Gables, cause I'm from Gables too...."
www.blurb.com where you can build books...photo books, business books, art books...BLOG BOOKS! I've explored the site a little bit and it looks like a pretty rad tool to use. I can imagine a lot of you out there have maybe even a few of these with the fantastic content found on your blogs. So I thought I would spread the good word a little further. So today I along with two friends hosted the last baby shower of my personal 4 shower marathon. 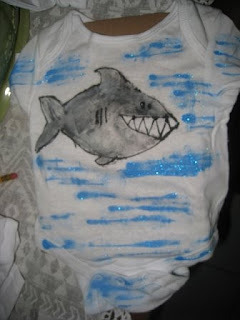 Per the request of the prego baby mama...I painted the shark from my painting onto the onesie for her little boy (did I mention that of the 4 showers...only ONE was for a boy?!). This is the onesie for CAP, due next month. CAP is going to be a big big boy...so only 5 of the 20 onesies were for 0-3 mos. We figured...he's big...and going to keep growing. Cheers to all of my prego friends...those who has their bouncing babies...and those waiting for things to happen. As for the onsie...I'm really enjoying making these...and will actually happily take orders!! It is hard to believe that it's been 8 years. I know this will sound cliche today but...I'll never forget where I was when it happened. 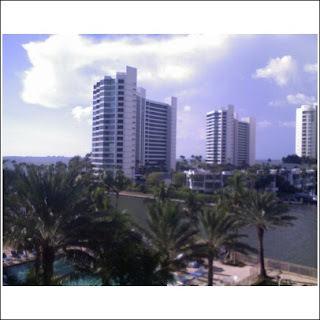 That morning I left Miami for Daytona Beach, FL. In a car--we opted out of radio and instead were listening to Dave Matthews. We pulled over for gas and a break at about 9:15. The second tower had just been hit--- there was a crowd of people gathered around what seemed to be the only TV at this Turnpike rest area. The top picture on the right was taken the weekend of September 11, 2004 --my first semester of grad school at Bank Street College of Education in NYC. 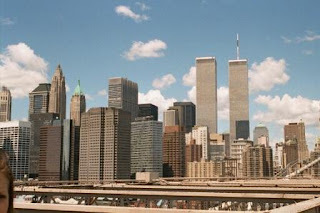 The bottom picture was taken August 2001. I was in the city visiting a dear friend from SMU along with 3 other friends. The 5 of us took lots of pictures n our last day on the trip as we walked from City Hall over the bridge into Brooklyn. 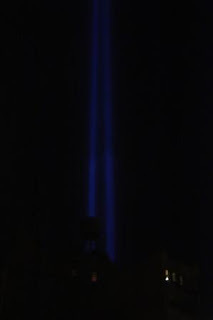 As an ex-part time New Yorker...I really do stop and look at where I am today---how so much can happen in 8 years...and how thankful we have to be that we are alive, healthy and surrounded by loved ones. ...never forget how nice we were to each other in the weeks after that. I LOVE...I mean...LA-LA-LOVE, The Beatles. I LOVE...I mean LA-LA-LOVE to sing. I LOVE...I mean LA-LA-LOVE Rock Band. 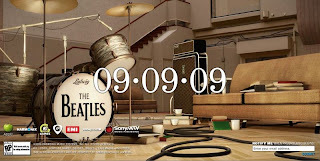 Today...I am one of the happiest girls on Earth because The Beatles Rock Band was released!!! Though I have not rushed out to Best Buy to buy it yet...I will this weekend...and my weekend (when not doing what I gotta do socially, work and volunteer wise) will be filled with the songs of the Fab Four. I CAN'T WAIT!!! I know...I am a dork...but D says he has NEVER heard me talk about a Video Game with anticipation...and he's right. I usually am really bad at them...but I love Rock Band...and I love The Beatles...so this is basically the BEST video game known to man...in my most humblest of non-gamer opinion. So as they say..."It won't be long (yeah, yeah, yeah) it won't be long (yeah, yeah, yeah)..."
It all really started on Saturday when NCAA football season started (ok--I know it started earlier but SMU and UF did not play until Saturday...and Lee Corso did not put on a mascot until Saturday). 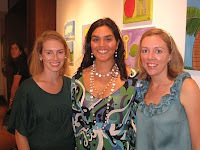 The other mark of fall...tonight was the first Junior League of Miami (JLM) General Membership Meeting (GMM). It was like the first day of school--seeing all my friends who have been away for the summer---or working really hard...the GMM's give me the opportunity to catch up with lots of great peopl e.
Tonight at GMM was especially nice because I heard so many great things from my JLM friends who were able to make it on Friday and those who could not make it but have stopped by Books and Books ...and those who are going to make their way out. This is what I am loving about the art being on display at Books and Books for the month...Books and Books is a wonderful local store and it is frequented by fantastic people...so I am glad that my pieces are bringing a smile...even a chuckle into the lives of those who walk past it. So yet again...I thank you. Fall is here...what better way to celebrate than with a fun piece of original art work, who's sale helps support a fine long lasting local institution as is, Books and Books. Art is really all around us our entire lives long. When you're little--those cartoon animated programs and movies are the art that first captivates you. Actually when Olivia finally started watching the Little Mermaid--that was fun because I got to watch and sing with her...well actually she doesn't like it when you sing with her sometimes...so I'd have to pretend sing with her. It's been fun rediscovering one of my faves with her. I also taught Olivia how to hold her crayons. That was a really time afternoon--she likes it when I draw something and then she colors ALLLL over it. I'm really glad I get to be a part of Art at Any Age with her. 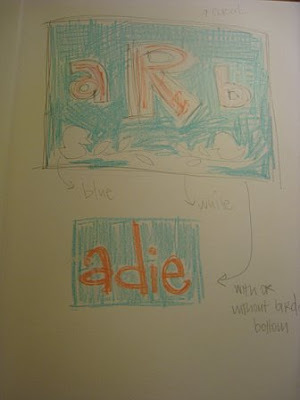 ...Another little girl to share art with...the simple joys of a piece of paper and crayons. So last night was wonderful! 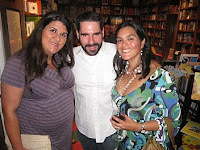 There were over a 100 people that attended the opening night of my month long show at Books and Books in Coral Gables. 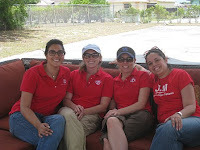 Some were friends, some were family and others were gallery walk attendees. All in all everyone really seemed to enjoy the new works and how they complimented the select older ones that are up. I can't say which pieces I heard people talking about the most as a lot of them had a buzz... the Pies were popular, Los Pollitos were popular as were the trees. I think I may have even sold a piece! I put a few pictures up here but I have also uploaded pictures on facebook and on flickr if you would like to see them all. Below you'll find the link to the Flickr photo stream. Thanks again to everyone who came out!! So everything is done and ready for tonight. Here are a couple of shots D took this morning after we installed the paintings. It sounds like a lot of great friends and family members will be coming out and supporting me tonight--so in advanced I wanted to thank you!! I can't wait to see you all. Ok--First I want to say I just spent nearly 9 hours with the Miami-Dade County Commissioners public budget hearing. ...so if this doesn't make too much sense...sorry. Anyhow...some of you may know that other than art and my work at the museum the other thing outside of my family and friends that make me happy is...fashion. 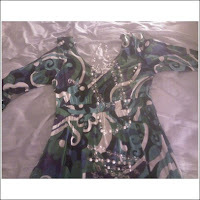 People have been asking me, "What are you going to wear? 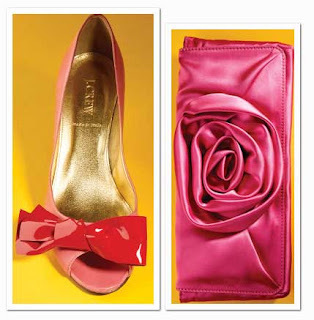 "...well I am wearing something very special to me. 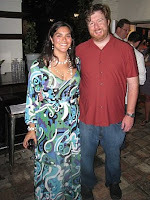 My dress is of my own design, hand made in Managua, Nicaragua. 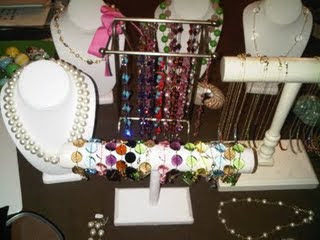 My necklaces, bracelets and earrings are handmade by Kristin Pearce, a dear friend and talented designer here in Miami. You should take a look at her etsy shop for treasures you can call your own. Tomorrow morning I will be hanging the show at 9:00am...and then I will be arriving at Books and Books at around 5:45pm. I am beyond excited and overjoyed at the support I have received from you all this summer. I can't wait to share tomorrow night with you...and if you cannot be there physically I know you will be in spirit. So thanks! 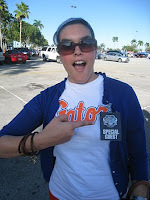 I will try and blog before the opening...if not you know I will after. I have found a great new site! Full of wonderful fun filled things for all of us who simply adore the Crew. Today, D's "GMa" turns a beautiful and healthy 87! The woman lives by her own in a lovely house in Coral Gables...she drives everywhere in her Cadillac...she plays golf several times a week...she emails!! She is a marvel and a true testament to a long happy and healthy life. Mother of 2...grandmother to I think 7..great-grandmother to at least 15! 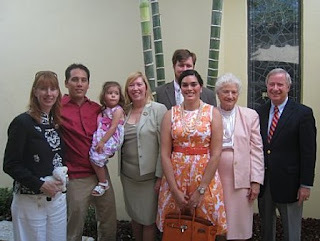 So Happy Birthday Grandmother...today's blog post is dedicated to you and the family you built. Today I found out that I will be hanging the paintings myself. Chances are I will be doing this tomorrow afternoon if not Friday morning. 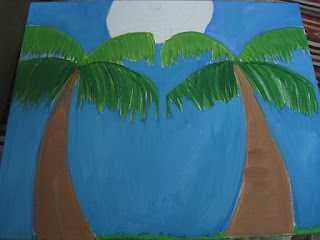 One of the paintings that will more than likely go up will be "Two Palms". This is the painting in its middle stage...it is now finished...but obviously I can't show it to you since it will be up on Friday. What I do plan on doing is posting pictures of all the finished paintings after Friday night.